Andrew and I have a dream. 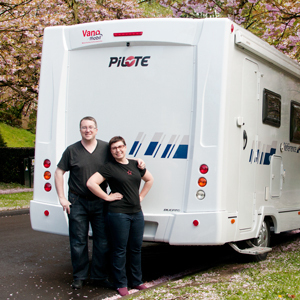 Our dream is to explore Europe while living full-time in a motorhome. To live our dream, we’re willing to give up our cozy apartment in central Brussels, our car, most of our stuff and our lifestyle. Oh yes, we’re also going to bring along our two fat, spoiled housecats who hate anything motorized. Are we crazy? Definitely. Are we going to do it anyway? You bet. First and foremost, we love to travel. Yeah, yeah, I know lots of people enjoy travelling, but it’s what we live for. In fact, for us, a life without travelling would seem like prison. We moved to Belgium from Canada in 2005 and our urge to travel, discover and push our boundaries has grown stronger each year. We already travel a lot, but recently we decided to make it the focus of our lives full-time. How we came to this decision is in a large part due to some very special people we’ve met over the past few years; people, who have this crazy travel addiction, like us, and who are actively living their dreams. The first of these people is Sherry Ott, solo female world traveler extraordinaire. I had followed Sherry’s blog, Ottsworld, for quite some time before having the courage to leave a comment, but when I finally did, it was a doozy. Essentially I invited her to stay in our home, while we were away, and look after our cats. You can read more about this crazy encounter and Sherry Housesitting for us here. Sherry was the first ‘real’ person we talked to, who was living the kind of life we wanted. She sparked a fire in us that simmered for a while, without us even realizing it. Through Sherry, in a roundabout way, we met Warren and Betsy Talbot, a year later. If Sherry was the spark to our full-time travel fire, then Warren and Betsy were the gasoline. The Talbots also came to house and cat-sit for us and we had an instant connection. They are corporate runaways, who sold everything they owned to travel full-time. By the time we met them in person, they were already writing a book about how they did it. , changed everything for us. It gave us the courage to figure out what our dream actually was, and now it’s giving us the steps to attain it. Before reading it, we had been looking around at all the full-time travelers we knew, either in person and on-line, thinking, “we can’t travel full time because we don’t want to give up our cats and we’re just not back-packers.” We hadn’t stopped to think about how we could live the nomadic life we wanted. So we sat down and thought about how we could travel with cats. Two ideas came to mind: renting short term apartments in different countries or travelling Europe by motorhome. Suddenly it clicked. I had grown up exploring the United States in my parents RV. Andrew loves driving and road-trips. We wouldn’t have to pack and unpack or try to cram our belongings in a backpack. We could even bring along the cats (although this is still a working theory at this point). And so our plan started taking shape. There are a few roadblocks in our path. And, as most things in our modern lives, they revolve around money. We need to pay off a huge chunk of debt AND save the money to buy an RV and fund our life before we can hit the road. This is where you come in. We’ve started this blog, well before our dream’s planned start date of May 6th 2016, for a couple of reasons. The first reason is accountability; both to ourselves and others. The more we put our dream out into the world, the more responsibility we’ll feel to stick to it. Sticking to our budget and saving money is going to be tough, so we’re hoping you’ll help hold us to it. Second, we want to share the process of paying off our debt, saving money and buying our RV with you, in the hopes that we can help others along the way. We are bound to make mistakes but hopefully someone else can learn from them. Third, we’ll be following in Warren and Betsy’s footsteps and we want to share how Dream Save Do has impacted us and allowed us to attain our full-time RV dream. We hope our success will encourage others to buy the book and follow Married With Luggage as religiously as we do. Alison Cornford-Matheson is a freelance writer and travel photographer. In 2005, she landed in Belgium where she founded CheeseWeb.eu a travel resource for slow travel in Europe and beyond. She dreams of the open road and exploring Europe’s hidden secrets in her motorhome, Amelia, with her husband, Andrew, and her spoiled house-cats. She can often be found with a Nikon, a good book and a glass of red wine within reach. You can also follow her on Google+ and @Acornn on Twitter. Hi my name is Sara I came across you when googling about taking my cat on road trip to Europe. We are in the process of buying camper van this year and travelling around UK I.e lands end to John of groats. Then planning big trip to Europe 2015 have to take Bella my cat with me she is house cat and travels really well. Worried about the red tape. Hi Sara. Thanks for commenting and we’d love to hear how you make out with your trip. I don’t think you’ll encounter too much read tape provided you get the pet passport from your vet and your kitty is up to date with all of her vaccinations. Good luck! Thanks will definitely checkout your website. Good luck with your plans too, you never know one of these days we may even bump into each other. I have ordered my book ‘dream save do’ from amazon can’t wait to get stuck in. That’s great! That book really changed our lives and shaped our future plans. I hope you get as much out of it as we did. Their blog and podcast is great too and frankly they are just super nice people. not yet fulltime, but also travelling with RV and Camping Cat EMIL througout Europe, nice to meet You!